You can turn any space into your own private dojo with the Spirit Katana 3-Piece Set on your shelf, table or wall, and they display easily with the included wooden rack/stand. They're perfectly sized to make up a dramatic Eastern showcase anywhere in your home or office with blade lengths of 26 1/2", 18 3/4" and 10 3/4", and overall lengths of 36 3/4", 27 3/4" and 17 3/4". 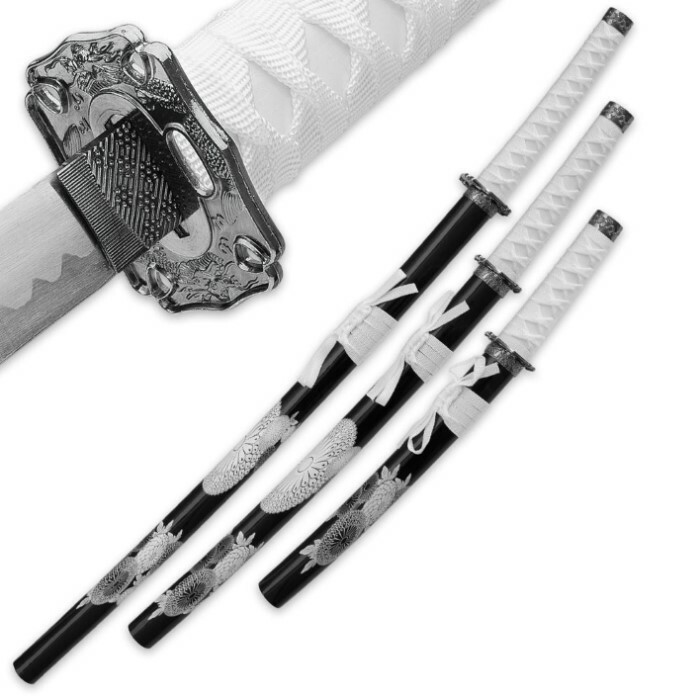 Each of the three matching swords in this handsome set oozes sleek Japanese style and eye-catching ninja allure with such elegant appointments as black wooden tsuka (handle), delicately wrapped in soft white cord (ito). The tsuka terminates at the intricately carved metal tsuba (guard) and habaki (blade collar) - both featuring dragon embellishments in relief. 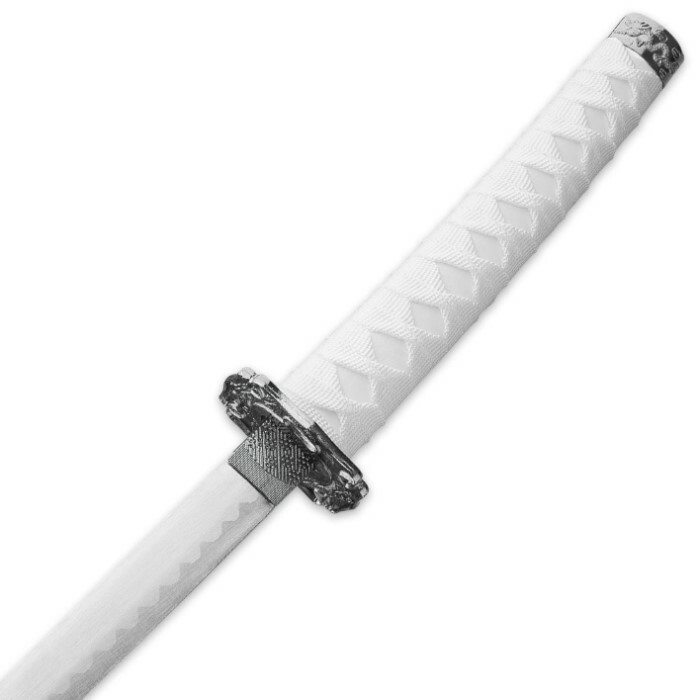 At the heart of each sword is the gleaming carbon steel blade with stylish ripple hamon (edge pattern). The blades are kept secure shrouded in their polished black wooden saya (scabbard) accented with ivory sageo (hanging scabbard cord) and Japanese geometric patterns in various shades of white. 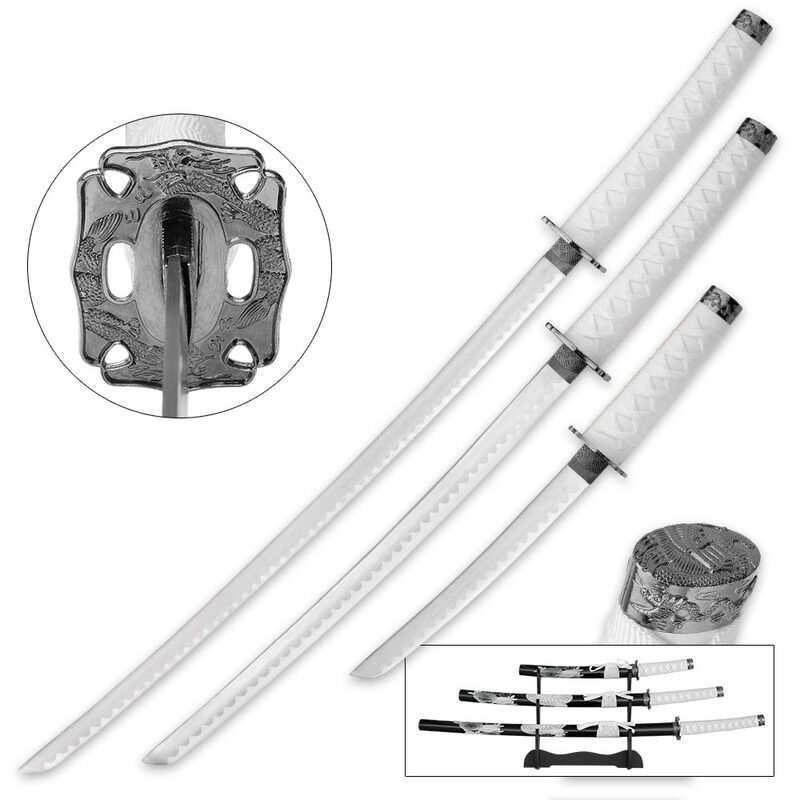 This stately Three-Piece Katana Set makes a wonderful gift sure to be remembered for years to come.